What are the Festival Activities Centres? The current Castellers de la Vila de Gràcia colla started to get off the ground in 1996 and they made their first public appearance in February 1997, in Barcelona's Plaça de Sant Jaume, as part of the diada castellera held in honour of one of the city's patron saints, Santa Eulàlia. They held their official presentation on 4 May the same year, supported by the Castellers de Terrassa, the Castellers de Sants and the Castellers de Sant Andreu de la Barca. Setting up the Vila de Gràcia colla represented a revival of the castell tradition of the Xiquets de Gràcia, a group documented at the end of the 19th century that kept going until the 1930s. It was founded by migrants who arrived in the city following the phylloxera plague and hailed from areas where human tower building was more traditional. The Castellers de la Vila de Gràcia wear a navy blue shirt and they have had their own rehearsal centre, the Espai Cultural Albert Musons, since 2012. This casa de la festa, a social centre popularly known as Can Musons - Musons' Place - is named after a cultural and political activist who was very well known in the neighbourhood. A diada castellera is held during Gràcia's big annual festival and it has become a tradition to walk a castell from Carrer dels Xiquets de Valls to Plaça de la Vila. In 1999 the group received the Barcelona Medal of Honour. They have been taking part in Catalonia's big castell competition in Tarragona since 2002, and in 2010 they finished eleventh. 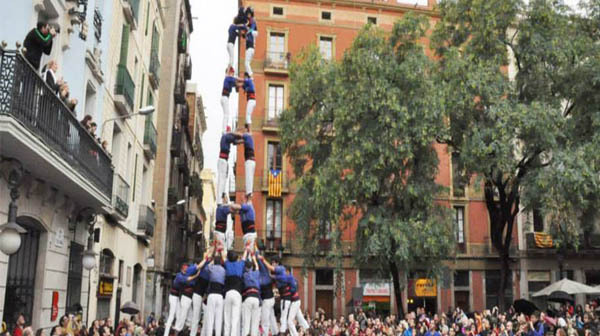 The best castells they have built are the three of nine (nine storeys of three people) with folre (a second-level base), the four of eight with agulla (a pillar inside the main tower), the five of eight, the seven of eight and the two of eight with folre. Since 1998 they have broadcast a programme on the casteller world on Ràdio Gràcia called "Terços amunt!" - Thirds to the top! It won the Vila de Gràcia prize in 2010. They also produce a weekly internal newsletter with information on their activities called "Si no aguantes… no t'hi fiquis" - If you can't stand the heat, keep out of the kitchen. The group forms part of the Coordinadora de Colles de Cultura de Gràcia, the coordinating committee for all the local colles, and is very active in the social life of the neighbourhood. Since 2001 they have taken charge of decorating its main square, Plaça de la Vila, during Gràcia's festival, in mid-August. They also offer the public the chance to attend guided rehearsals, so they can get a better understanding of casteller culture.